ISS crew unload Dragon's cargo Jump to media player An unmanned Dragon spaceship has successfully arrived at the the International Space Station (ISS), where astronaut's have begun to unload its cargo. 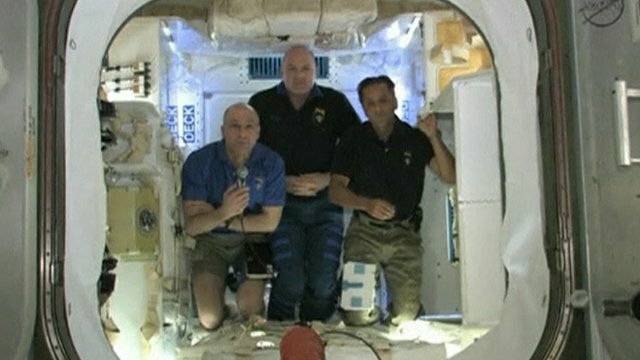 Astronauts praise Dragon craft Jump to media player The California SpaceX company has seen its unmanned Dragon cargo ship attach successfully to the International Space Station (ISS) for the first time. The unmanned SpaceX Dragon cargo ship has successfully arrived at the the International Space Station (ISS), where astronauts have begun to unload its cargo. Dragon is the first commercial vessel to dock with the space station.